The mega project that launched primary research, my book, a business, and a series of blog posts is called the Career Agility Project. It also informed my ideas around creativity, growth, and happiness. This article focuses on the research side of the project, along with the completion of the first infographic on this topic. As a side project, the process of exploration and writing Activate Your Agile Career took five years. The ambitious project included 1:1 interviews and hiring a firm to conduct survey research. My goal was to better understand how some people respond to change, adapt, and progress in the workplace, while others falter when faced with change. While researching the topic of agility for the book, I took note of my personal career decisions and navigation. My approach included a hedging your bet strategy. Just like a diversified financial portfolio, I managed my experience and skills portfolio, refining and optimizing it regularly. My career became a platform for personal development, establishing a pattern of empowered agile behavior. Identifying two types of career personalities, agile and steadfast, here are my findings. It’s important to mention that most of us fall somewhere between the extremities on the agility scale. Higher agility scale scores correlate to a higher comfort level with uncertainty and change and lead to a state of continuous career progress. While there are many behaviors recognized in the findings, there are three in particular highlighted in the infographic below. In addition to the 1:1 interviews I worked with Researchscape International to conduct survey research with people in the middle part of their careers. As a result, Mid-Careerists in a Time of Change offers stats and behavior observations that helped me understand how workers navigate change and excel in the modern workplace. The infographic below highlights three central points of the research. In conclusion, there are three career agility behaviors to consider as you develop your workforce. 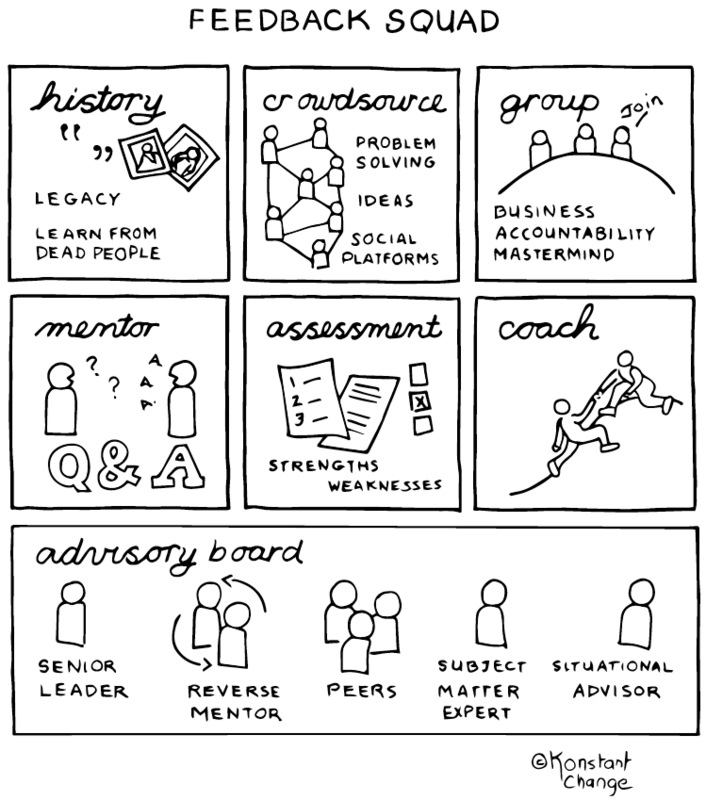 Agility thinkers differ from steadfast careerists in how they think about getting help to grow. 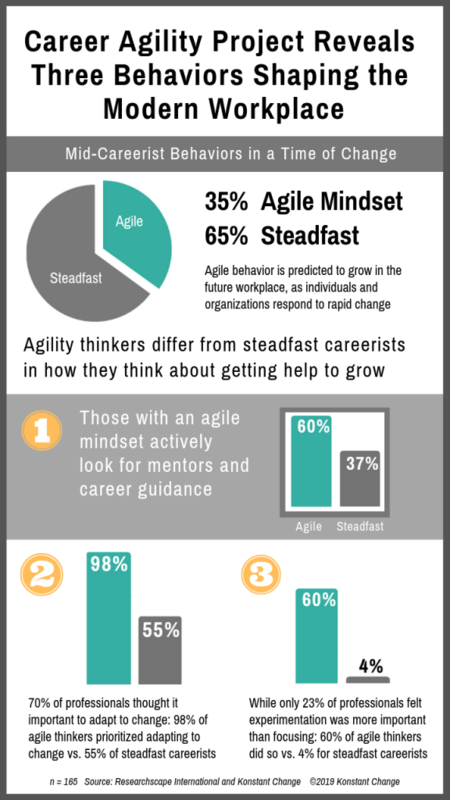 For example, those with an agile mindset look for mentors and career guidance: 60% vs. 37% steadfast careerists. prioritized adapting to change, compared to 55% of steadfast careerists. Only 23% of professionals felt experimenting was more important than focusing. Yet, 60% of agile careerists did so, however, compared to 4% of steadfast careerists. While Activate Your Agile Career centered on the individual workplace perspective, The Happy Profitable Employees Project™ opens up a new area of research. The project will include insights from business leaders on workforce development opportunities. I want to gain an understanding of how agility can support broader strategic goals in a rapidly changing workplace. I am in the process of creating an article and report, weaving together employee and employer perspectives on agility and change.